With mechanical arm , automatically spraying system through remote control. 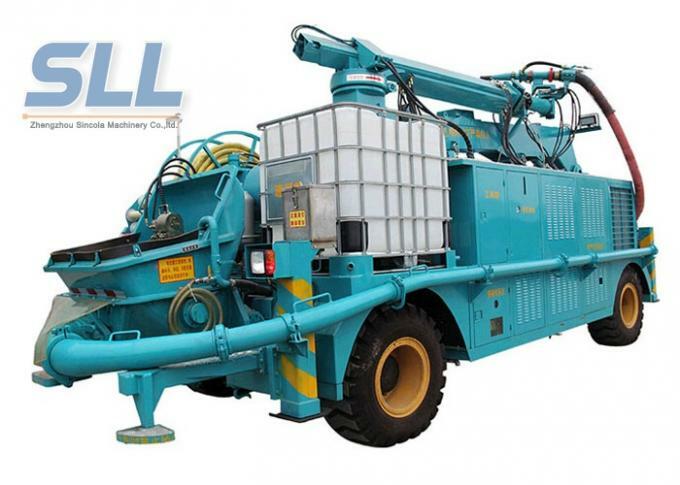 This Mechanical Arm Automatic Guniting Machine are suitable for bigger fracture surface, project which need big output, and tunnel construction which need high efficiency shotcrete. 3. Choose different wheels according to your needs. 1. 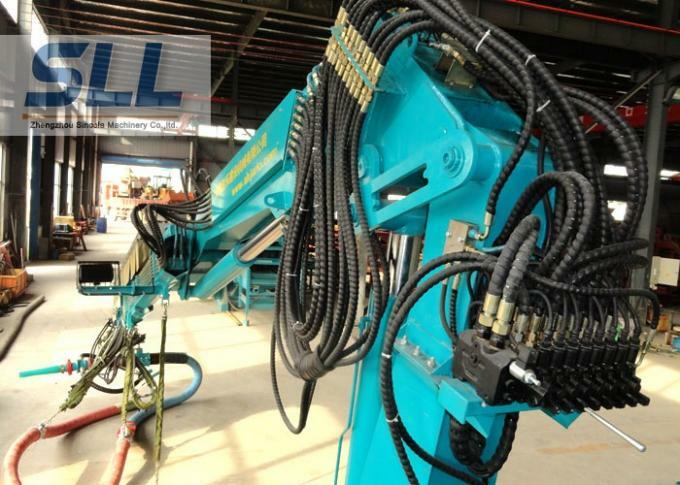 Mechanical Arm Automatic Guniting Machine For use in mines, tunnels and outdoor construction. 2. With robot telescope arm, Pumping and Spraying concrete automatically. 4. All the machine functions are available via the remote control, which facillitates the operator’s work. 5. The six wheel drive increase its perfect manoeuvrability in difficult driving situations. Intelligent spraying control, high accuracy, wide spray area, minimum spray rejection. a. long-reach spray boom allows to work at long distance and great height. b. 3-PRS spray head gives full spherical spray area without blind spot. c. Full hydraulic intelligent spray boom guarantees no interference when all boom sections working at the same. a. Rigid chassis, internal combustion – hydrostatic transmission, 4-wheel drive, 4-wheel steering with swiveling driver’s cab. a.Advanced undamped hydraulic system with 1200mm stroke length offers high and steady pumping pressure, also reduce power consuming and parts wearing. a. Reliable frequency convert technology complied with PLC and computer control offer a setting control of adding rate depending on concrete out put. b. Auto-adjusting frequency control offers motor speed change and auto dosing according to concrete delivery amount. 1. 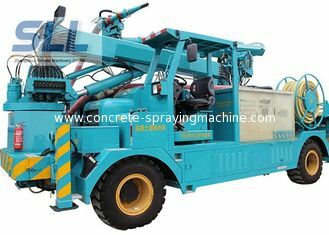 Full Automatic one set concrete spraying machine for mine, your machine, is it suitable for the project? 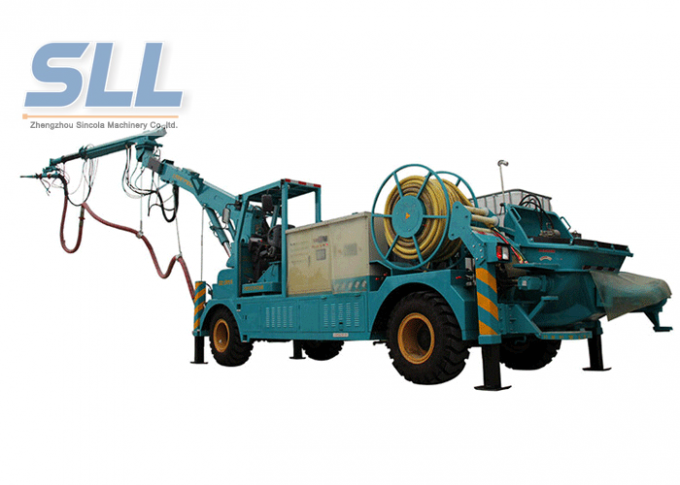 Yes, Our concrete spraying system, It is a whole unit of pumping,spraying. With robot telescope arm, you just control the machine, it will automaticlly working for the project. 2. How much is Mechanical Arm Automatic Guniting Machine price? It's cheaper than other in the market. The detail price, you can contact me by email,I'll send you according your requirement. 3. I need the machine for tunnel construction spraying concrete, is it suitable for the project? 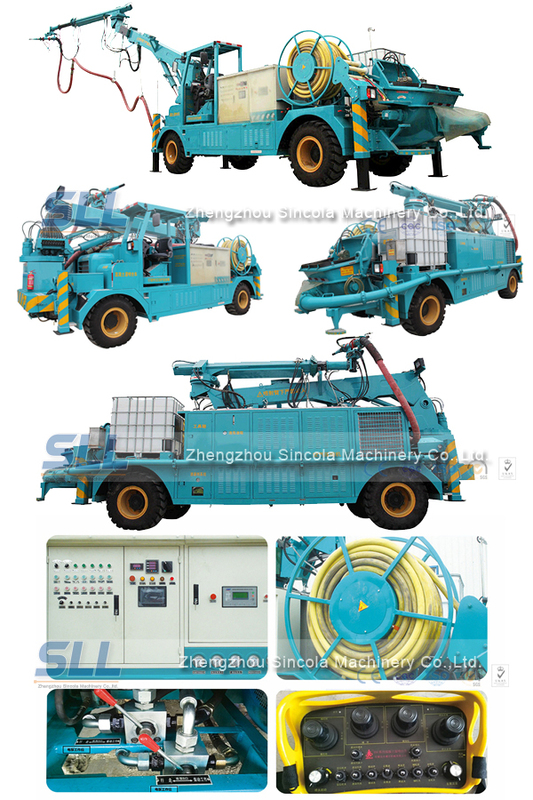 Of course, our the robot shotcrete machine, is a professional for mines,tunnels,etc. 4. 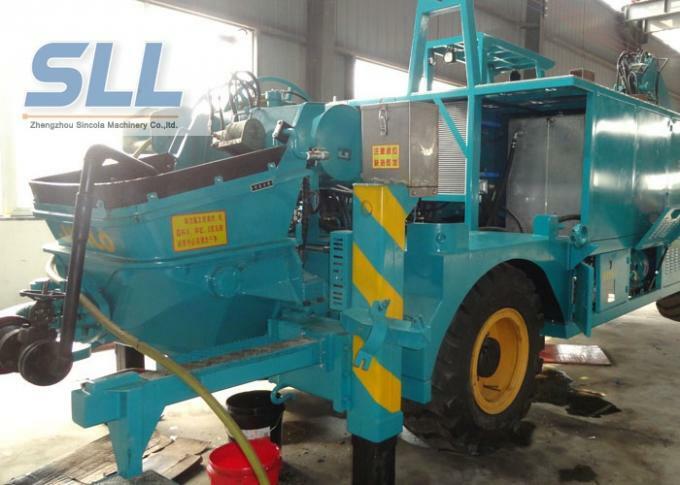 Do you have larger capacity concrete spraying machine? Yes, we have machine of out put capacity: 5m3/h, 7m3/h, 9m3/h (by manua); 15m3/h, 20m3/h, 25m3/h, 30m3/h, 35m3/h (automatic arm). Please email me about your requirment,i'll offer you as soon as possible. 5. 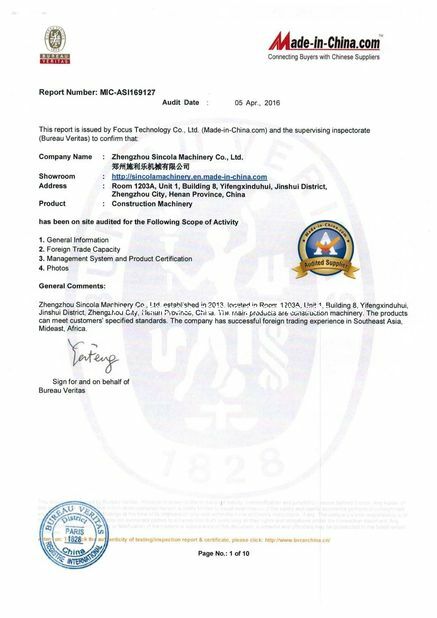 Can you offer the machine operation training? Yes, we can send technicist to training if you need. 6. The Mechanical Arm Automatic Guniting Machine, can it be transport by container? 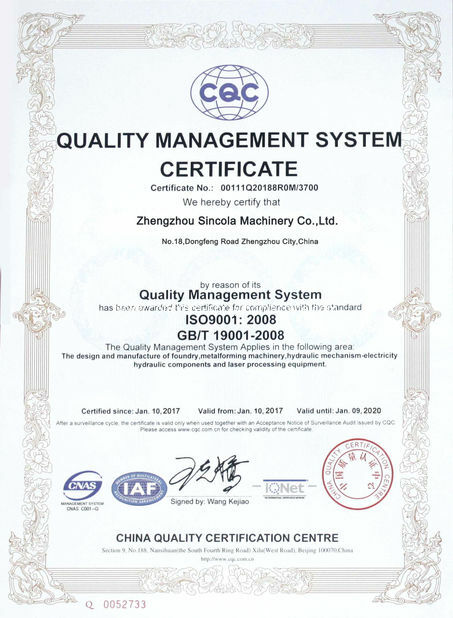 Yes, we had ever export machines to international market , the shipping is no problem. Our main products are Shotcrete Machine (dry mix shotcrete machine SPZ-3,SPZ-5,SPZ-9, wet shotcrete machine), Shotcrete Pump, Concrete Pump, Concrete Mixer Pump, Concrete Mixer, Mortar Mixer, Cement Grouting Mixer, Cement Grouting Pump(Low pressure, high pressure), Mortar Spraying Machine, Mortar Pump,Putty Spraying Machine,Automatic Wall Plastering Render Machine, Industry Peristaltic Pump / Hose Pump etc .